Immigration Authorities in Canada conducted a large Express Entry draw, after the introduction of the new format. 3,000 candidates, under all programs, were issued the ITAs for seeking permanent residence in canada The CRS score, recorded as lowest was 442 and remained two points lower than the score of the draw held earlier. 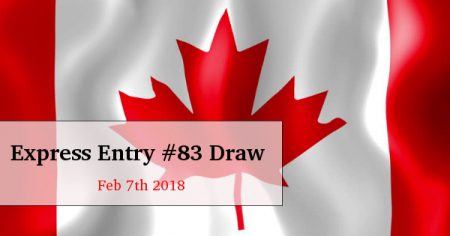 This draw was the third to be held in 2018 under Express Entry and overall it was the 83rd. Using a modern format, the Authorities of Immigration, are in a position to set a precise number of ITAs for issuing. When the strength of candidates, who had obtained the least possible score, exceeds the authorized numbers invited, a tie-breaking method is implemented to issue such invitations, which are based on the time and date of receiving the application. It is earmarked as per the stamp also. It means that, when more candidates, obtain the least score, the limitation mark is calculated on the date/time of submission of their Express Entry profile. Earlier, the number of candidates who were invited after this change was 2,750. In the present draw, 3,000 profiles figuring in the pool were eligible for receiving an ITA. This Changed format permits the Immigration to manage the process of implementing and selecting a precise number of candidates to for receiving the ITA. In the past, this was not possible. This draw was a continuation of the trend in the Express Entry system, in which the least CRS score was below 500. IRCC implemented the Express Entry system on January 1st, 2015 to manage applications of workers who are skilled in the Federal Economic programs. This includes the Canada Experience Class, the Federal Skilled Worker Program, and the Skilled Trades Program, apart from of the Provincial Nomination Programs. It is expected that there will be nearly 30 draws. In these draws 70,000 invitations will be issued during the present year. Majority of these draws will have a CRS score which is below 450 for enabling the authorities to achieve the annual immigration target levels for the year. The Employers must secure an LMIA or a nomination in the PNPs for retaining the employees for a long-term.